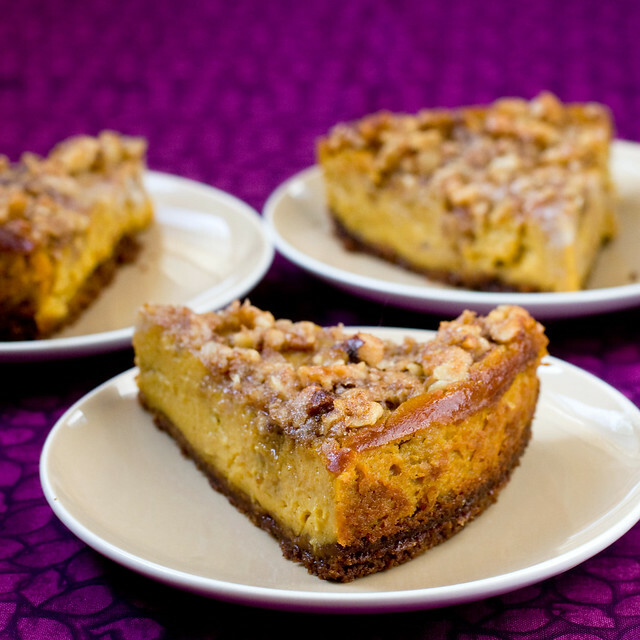 This Pumpkin Cheesecake was among our favorites in Vegan Pie In The Sky! All those autumnal spices with lots of pumpkin flavor and an irresistible pecan crunch topping. It’s so delicious, it makes you feel a little funny. And don’t worry about serving this to even the biggest tofuphobe, they will not complain one bit. While there are perfectly adequate vegan cream cheeses available in supermarkets, we wanted to come up with a cheesecake formula made with pantry-friendly ingredients, for a few reasons. One is consistency: different brands will produce different results. For another, some vegan cream cheeses contain hydrogenated oils. We want to bake with accessible real foods. Also: the cost. For one recipe, if you’re talking 3 tubs of cream cheese, when all is said and done you’ve just spent a good 25 bucks on a single cheesecake. Ouch! This way, even if you do spend 25 bucks, you have ingredients that will last you awhile and make lots and lots of cheesecakes. And lastly, well, we just think it tastes better! We worked for months and months to develop the smoothest, creamiest and richest vegan cheesecake base possible. The ingredients we landed on were soaked cashews, coconut oil, banana and silken tofu. The end result is firm but creamy, easy to work with and a dessert that’s a little difficult to not steal bites of. That’s only a bad thing if you care that by the time the guests arrive there’s already a sliver missing. A few recipe notes before embarking on your vegan cheesecake adventure! ~For the crust, vegan graham crackers can be hard to find. If you can’t find them, you can either make your own, or use gingersnaps. We baked a few of these with gingersnaps and they were amazing! ~Soak the cashews overnight to make quick work of the recipe. You can cover them with plastic wrap if you’re afraid that your kitty will get to them. ~Although this recipe is for a fancy marbled cheesecake, you can skip that step if you’re pressed for time or would just rather not do it. Just mix everything in the filling together instead of dividing the batter and swirling. ~You can use either water packed silken tofu or the vacuum packed kind (like Mori-Nu.) If using Mori-Nu, extra firm silken works best. Drain the cashews and place in a blender with the banana, tofu, sugar, brown sugar, coconut oil, cornstarch, lemon juice, vanilla, orange zest, and sea salt. Blend until completely smooth and no bits of cashew remain, a food processor or strong blender should be able to get the job done. You posted this not a full minute after I was saying to my boyfriend “I have no idea what to bring to your friends’ Thanksgiving party!” Guess that settles it! I bow down to the cheesecake goddess. This. looks. amazing. I bought this cookbook just for that recipe! My first attempt at it is cooling in the fridge this very moment. 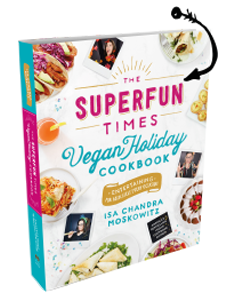 I bought the book a couple of weeks ago and can’t wait to try at least 2 or 3 of them for my first vegan Thanksgiving! If I could, I would rake your yard and clean leaves out of your rain gutters. Thank you for sharing this recipe. We have this in the oven RIGHT NOW! I kid you not! We have many recipes marked in the book and this is our first one to make. So excited to eat it. Will we be able to let it cool overnight?!?! Doubtful! Isa, I promise I just told my boyfriend (after taking your pumpkin muffins out of the oven) that I want to make a pumpkin cheesecake, but vegan cream cheese is expensive. Thank you so much! I made this on Friday (using the book, obvs)–the flavor is amazing! My hubby has been happily gorging on it ever since. I worry that I undercooked it though. What should I look for to assess doneness in the middle (mine was pretty jiggly, for lack of a better term)? Ok, just tried the first slices after 4 hours of chilling. Amazing! Thanks Isa, you’re brilliant! Does it matter if the coconut oil is refined or unrefined? Can I use fresh pumpkin rather than canned one? I tried it in your pumpkin cocoa loaf ans it work perfectly. Another reason for not using bought cream cheese is for those of us who live in countries where you can’t get it (I am in South Africa)! I just unwrapped my copy of VPITS (purchased from a local online book seller) and gingerly checked the cheesecake recipes (before I read your post) to see if I was going to be disappointed and yay!! Home made cheesecake again. Thanks soooooooooooooooo much!! Oooooh I’m cooking for an American friend on Saturday night and this may be just the thing for our dessert, a taste home with the pumpkin and pecans! Am very much looking forward to trying it out (and she’s bringing me an American measuring cup, so it’s easier for me to cook from Veganomicon!). Oh – and canned pumpkin purée isn’t really something we can get in the UK – if I use fresh do I need to squeeze the moisture from it or do anything else? Yep, just roast the pumpkin, squeeze through cheesecloth and puree! This looks amazing. I don’t know if I can wait until Thanksgiving though; I think I definitely need to make a practice one this week. One question: the silken tofu. I’d assume you mean the vacuum-packed Mori-Nu kind, but I know you’ve used the water-packed kind in recipes before. Should it be one or the other here? Damnit, nevermind. I was obviously so excited that I missed your note about that. Sorry! That’s good to hear though, because Mori-Nu is hard to come by. I didn’t think it was possible to love you and Terry more, but…I do. Thank you, thank you, thank you for this Tofutti-free cheesecake! I can’t wait to try it!! Has anyone experimented with traveling with this desert? I need to make something and take it cross-country in a cooler. It would be made on Tuesday, carried on Wednesday, and consumed on Thursday. Any thoughts? My room temperature coconut oil is solid. Is that normal? My house is super cold! Should I melt/soften it a bit for the filling? Yes it gets solid when it’s cold. No big deal, you are blending it and baking it so it will be fine. You’re right, it’ more like 1/2 a banana. I will fix it, thanks! This was the first thing I made from the book! It’s sooo good! i made this when i first got your book in the mail. theres a pretty pic of it on my blog kzcakes.com 🙂 i made the apple cream raisin one this weekend and it was killer. yeah buddy. This looks fantastic! I was wondering if you think it would work to add extra pumpkin in place of the banana? Yep that would be fine. I’m THRILLED to find a cheesecake recipe without Tofutti cream cheese, which tastes like fat and chemicals to me – Thank You! Also… I’ve overcommitted and overextended myself for the Thanksgiving feast for the in-laws (again), but it sounds like I can make the crust and topping a day or two before, then bake the cake the night before, thus relieving myself of some last-minute stress. Perfect! This looks so good! I am definitely going to try this! Thanks! Nice, i am also allergic to pecans, which nut would i use instead which could work ? or fruit? You can use walnuts or hazelnuts. I tasted this at your demo at DC VegFest…..yummmm!!! Will be on the menu for Thanksgiving. Thanks for posting!!! This looks soooooo good! I can’t wait to try it out. Finally! As vegan cream cheese its rarely available and very expensive because imported here in Germany I was looking for a recipe without it for ages. Thank you so much! This pie rocks my world! This is going on my activism list, aka things to make and bring for Thanksgiving!! Any suggestions for something I could use in place of the banana? More pumpkin? WHOA! SUPERB! Hands down best un-cheesecake! I had not made an uncheesecake before because I hate using expensive packaged stuff as an ingredient, like branded uncream cheeses. Served it to a girls night tonight, and it was a huuuuuge hit! amongst all. I made it with gluten free graham crackers, which was an easy though pricey sub, for a delectable vegan gluten free pie. My anti-gluten/dairy friend was so happy. Question about the amount of pumpkin purée: in the book it says 1 1/4 cup, but in the recipe above it says 1 3/4 cup. I made it using the book instructions and it turned out good, but it did seem a bit smaller (shorter) than I expected. Is the ideal amount 1 3/4 cup? non-vegan friends, and they LOVED it, as did I. We were testing it out as a Thanksgiving dessert candidate, and I think it made the cut. Thanks! I made this recipe after I bought Vegan Pie in the Sky. It was fantastic! I brought it to a small dinner party, normally, I leave left over dessert, but in this case I brought two pieces home. My husband and I had it for breakfast the next day. So good!! It’s on the menu for Thanksgiving. Also, the Chai Rice Pudding Pie, amazing! wow! this was a joy to make and eat!! i made this for some very carnivorous friends (along with a couple of dishes from “appetite for reduction” and it disappeared in record time. i’ve never made a vegan cheesecake before, but this is going to have to go into my kitchen rotation. This cheesecake is in the oven right now – it looks and smells great! Wondering if this would freeze well? I made it as a test run before thanksgiving and doubt my hubby and I can eat the whole thing ourselves before tofurkey day. Would be great if we could freeze slices to eat later when cravings strike. Let me know what you think.. Thanks!! I tried freezing it and it came out beautifully. Couldn’t tell the difference. Wow. that’s so good to know, thank you! thanksgiving adjacent « corrina, darling! I can’t find my spring form pan and spent all my T-Day dough on food and drink. Any thoughts? I was thinking maybe large muffins, or just a square brownie pan and doing cheesecake squares. I can’t wait to try this, thank you! I like the square idea. Do i have to do this in a springform pan? can i just use a store brought grahm cracker pie crust instead? You’ll have double the amount of filling but it might work! Let us know. Not quite the same. Earth balance would be a better bet! We are thinking of making this for a dinner tomorrow but trying to use what we have in the house. We are lacking the coconut oil. Totally wrong to use olive oil instead? I note you said Earth Balance above. Which is better? Olive oil or Earth Balance? This is a great cheesecake! I made it once without the crumble since we had a pie emergency. This year, I put the pecan mix on halfway and the pecans started to burn about 10 minutes into cooking. I double checked myself and didn’t miss any ingredients. Any thoughts? I guess next time I’ll just add the crumble when it’s just about done instead of halfway. Made this today for our feast. Our family members thought it was the bomb saying it was better then anything they had gotten in the fancy shops in the city! Can’t wait to try another recipe from the pie book! I made this to bring to my family’s thanksgiving feast, but for some reason the lemon juice and orange zest completely overpowered every other ingredient. It wasn’t a bad pie, I just didn’t get that pumpkiny goodness I had hoped for. Any tips for tomorrow’s attempt? I guess all I can say is that if you didn’t like the zest and juice then leave them out. I am surprised it was overpowering since each ingredient is just a hint. Fantastic cheesecake! Made it for Thanksgiving yesterday and it was a huge hit. Super simple, too. Thanks for sharing! Thank you for this recipe. I served it to my family and they loved it. I made it gluten free, and they could not believe it was vegan too. Though mine was not as photogenic as yours. Thank you! This was a bit hit at Thanksgiving this year. Next time I will use less orange zest because that tiny little teaspoon overpowered the rest of the flavors. Thank you for this recipe! It was the shining star of our Thanksgiving feast. I was nervous since the first time making it was for Thanksgiving, but it turned out perfect! My husband says “Don’t bother with the rest of the meal next year. Just make this.”. I made this for thanksgiving. Except I used a full cup of pumpkin, since I used fresh. It was good, but I would say that 1/3 cup of brown sugar on the pecan topping is a bit much. A little too sweet. Other than that, it was good. Very decadent. I made this for T-gives. It was a huge hit!!! I am thinking about eliminating the pumpkin and spice and adding more orange zest, a bit of orange juice and creating Cream Sickle cheesecake. This is such an amazing cheesecake base, I am sure it can be altered in so many wonderful ways. Thanks!! I made this over the weekend and it was delicious! My husband is taking in the leftovers to his friends at work as a fine example of the food you can eat when you’re vegan. I agree with the orange thing- it was too much with the pumpkin for this to be a really pumpkiny cheesecake but it was still tasty! Next time I’ll omit the orange zest. I ran out of ginger snaps (only had about a half a cup) and the store was closed so I ground up some oatmeal for the rest of the crust and it worked really well! The crust probably wasn’t as sweet but it really balanced out the sweetness of the pecan topping. I will be making this again in a few weeks when our family comes out to visit! If I wanted to substitute the refined sugar in the filling how would I modify? Was thinking of using maple syrup and/or maple sugar or brown rice syrup…would that work and would that greatly affect quantities? Thanks! Great recipe. I will probably use less brown sugar in the topping next time. I also only used 1 tbsp of sugar in the crust and that was sweet enough for me. I didn’t mind the orange zest, but thought the banana flavor was too noticeable in the non-pumpkin portion of the batter (maybe sub with more pumpkin? or just don’t divide the batter?). Overall, I was very happy with how it turned out. Thanks. This was the most incredible cheezcake I’ve ever tasted!!! Hi Isa! Is there anything I could substitute for the soy? I got your pie book as a Solstice gift and I love it so much!!! (Also, I loved your dedication to Adrienne Shelley.) I can’t wait to try all the recipes. I just pulled the pumpkin cheesecake out of the oven. It smells divine. I can’t wait to try it, but I will have to wait until tomorrow. I made this last night but I replaced the pumpkin with sweet potato. It was fab!!!!! In response to earlier commenter Rebecca, I made this for Thanksgiving in a store-bought graham cracker crust and it set fine. It was a bit difficult to get all that filling in there, but it wasn’t a huge issue. At least 3 relatives loved it come dessert time. Only thing: don’t be a dolt like me and buy a graham cracker crust with honey. When will I learn that I should ALWAYS read the label?! Duuuuuuuuuuude! I made this for Christmas, and everyone was swooning! It turned out absolutely amazing. I used all-natural ginger snaps for the crust and it’s a keeper for every year ahead! This is a great recipe. I have made this couple of time. Always a hit. Thanks! I have a question about the graham cracker/cookie crusts. I have made a ton of these pies with these crusts but have so much trouble getting them to come out of the pie plate when sliced. I made the most beautiful grasshopper pie to bring to an event and it was mutilated because no one could scoop out a slice with any crust coming with it. I was left with a plate full of chocolate crust and no more filling! This also happened with the boston cream cake pie. Help! how can I keep my crust in tact with the pie? I tried lots of spray, tried less spray… Nonstick pie plate? I will be honest and state I have not tried this, but I am considering it and adding a tbsp of apple cider vinegar. It sounds strange, but ACV is perfect for adding a cheesy tang without using actual cheese. i have made this twice now, and the second time i subbed almonds in the topping because we had them on hand and i had spent the grocery budget for the week and couldn’t afford the pecans! it turned out great. both times i also added about 1/4 cup of the filling to the topping, to make it mix together a little more i guess, and we really liked the outcome. thanks for another great recipe – i’m so excited i just got Vegan Pie in the Sky in the mail and can’t wait to start making delicious treats from it! Thank you for this luscious recipe. I made this for a mixed (you know what i mean) group, and it was loved by all; a HUGE success. And how much did I enjoy informing the satisfied participants, after they’d wolfed down their portions, some on seconds, that it was a vegan recipe? Very much, indeed. Sorry there was no time for photos, as mine looked almost as nice as yours. Many thanks! I would really love to make this! My only issue is that I don’t like pumpkin. Crazy I know (or so everyone tells me), any suggestions for a good sub? W.O.W. I bow to you and say thank you Pumpkin Cheesecake with Pecan Topping Recipe Goddess. Aside from eating such deliciousness the next best thing was revealing the non-dairy ingredients midway through eating it … hehe. It’s starting to become my favourite part of a meal: the horror, the disbelief, and finally the acceptance that it really is just too good 🙂 The only problem is finding pumpkin puree in Australian shops – I had to make my own after trying three different supermarkets. Suggestions anyone? Hi! I am planning on making this for Thanksgiving this year but was wondering if there was anything I could substitute the banana with since I am allergic to bananas. Thanks! P.S. I can’t wait to make the rest of your recipes as well!! I am also allergic to bananas and dairy, and I would love to have cheesecake again! So If you have any great subs for the Banana that would be so great. I am so looking forward to trying this recipe! Use like 1/4 cup more pumpkin. Have you ever made this recipe with stevia. My husband is diabetic and I don’t want to feed him the sugar. The picture looks absolutely delicious. I really want to try it. I cannot have tofu/soy and was curious if you could use a cashew cream instead?? Thanks so much! Your recipes are awesome. So glad to have you in Nebraska!! So my friend and I made this today to get into the Autumn spirit and firstly, I will say it is wonderful. There is a little hitch though, it’s a little oily. We followed the instructions and everything came out a little oily. Any tips? All I could taste in this was the orange and lemon, which wasn’t bad but I wanted more pumpkin flavour! Have you ever tried this pumpkin cheesecake recipe using sweet potatoes? Or do you have a good sweet potato pie recipe? I made this bad boy for my 2-year-old’s birthday party. Huge hit! It’s so rich you can serve about 20 people with it. I agree with one comment that it seemed a bit oily — I used coconut oil. Next time I’d just cut back on that. I also used ginger snap cookies ground up the blender for the crust which worked great. Wonderful recipe! I just baked this and have to say my house smells AMAZING! Thanks for posting this. I live in rural Idaho and finding vegan cream cheese is all but impossible. looking forward to feasting on this on Tofurkey day along with your wild mushroom roast with a morel mushroom vegan demi glace. You are AWESOME! How long do you think this will stay good for? I doubt it will be around for any longer then a week but I was not sure. i’m trying this for Thanksgiving. I can’t wait! I have this baking in the oven right now – the filling was delish raw! However, looking back over the recipe, I realize that I accidentally doubled the cashews!!! Hmmmm, I guess that will just make it extra creamy? Here’s hoping the texture comes out ok! I’ve done it with 1/3 cup coconut cream instead. This was incredibly delicious! I have been making pumpkin cheescakes for years for my boyfriends firehouse Thanksgiving dinner, and this was the first year we have been vegan. I found this recipe, and tried it yesterday. Wow! It was gobbled up with numerous compliments and no one was the wiser it was dairy free! Thank you! Wow, absolutely amazing and super easy! I even made the gwam crackers for the crust. Thank you for making our Thanksgiving for us and our “meat-eating” parents. so yummbo. A friend has been bugging me for a year to make this again, but she chooses inopportune moments (such as when we go to stay in a friend’s cabin). It’s her surprise birthday lunch on the weekend so I’m finally doing it again. I think I’ll sub out the banana as I could taste it last time and I just want the pumpkiny goodness. And I’ll probably go easier on the coconut oil as that was a bit strong last time. FYI, I steamed pumpkin rather than using canned, and just left it soaking in a little maple syrup and water over night in the fridge…. I’ve never seen canned pumpkin over here in Australia. Made this for Thanksgiving, amazing! Couldn’t stop picking off the topping. Didn’t taste like cheesecake to me exactly, but it was creamy and rich and delicious nonetheless. Mine didn’t look like that at all…and it didn’t all fit in the pie crust….I wonder what I did. What consistency should it be? Did you use a springform pan as the recipe says? This was my first time baking with coconut oil and so I may have done something wrong, but when I baked the crust, oil oozed out of the springform pan and out into the bottom of the oven. When baking the actual cheesecake, I had to put a pan under it, and the cheesecake came out of the oven basically swimming in coconut oil on the pan. Does anyone have any idea what I did wrong? I made this and it was one of the best things I’ve ever eaten. I streamed and pureed some pumpkin instead of using canned, and used rice flour instead of corn starch. Looked and tasted perfect, thanks! Made this yesterday! Soo good. It reminded me of the sweet ricotta used to make sicilian sweets (eg “cassata siciliana”). YUM! I made this tonight and ate an 8th of it. Yikes! It had an amazing texture and the topping was super tasty. But mine tasted more like banana and less like pumpkin. : / Is there any way to leave the banana out (ie add 1/4 cup more pumpkin)? I like banana, but I like pumpkin much better. Thanks for sharing. I made this for my daughter who has a dairy sensitivity. I found the orange zest to be a bit over powering. The texture was great though. I think next time I might omit the orange zest and add a bit more of the pumpkin pie seasonings. I also didn’t have a hazel nuts so I just finely ground pecans in in place of them and it was fine. My first time making cheesecake EVER and I decided to make this one that is vegan to bring to a potluck. It was amazing and no one could tell. I decided to just mix everything together in the filling…it was delicious! My first recipe that I have tried from you and I can’t wait to try something else. the coconut oil in the filling- it says at room temp, does that mean melted? or solid? thanks! Looks fantastic 🙂 how necessary is the banana though? I’ve got at pretty nasty allergy! An odd one I know, what could I substitute it with? Just add some extra pumpkin. Liiiike 1/4 cup. My wife tried this recipe last night, first thing this morning we both tried it and it is tasteful and very few ingredients, that’ s a keeper in our household from now on… Thanks for sharing…..
Has anyone had any luck making this ahead and freezing it? Would this work without changing the texture? Would you freeze before or after baking? Question re: coconut oil: Is it essential to the recipe? Any chance I could leave it out of the filing or substitute another oil like canola or olive or a touch of earth balance or even a nut butter? Any suggestions you have would be so appreciated. Dying to make this for the upcoming holiday. I made this recipe for the first time last week and it was yummy! I used gingersnaps to make the crust and the texture of the pie (cake?) was wonderful, like a light cheesecake. I will say I found the orange zest a bit overpowering and may tone that down the next time to allow the pumpkin to take more of the spotlight but overall lovely recipe I will definitely make again thank you Isa! I’m making this again for Thanksgiving. Absolutely delicious recipe. Thank you, Isa!! Is there any way you’d happen to know the carb count for a serving of this? Made it and my little one is diabetic, as we just found out Thursday, so just wondering if you’d happen to know 🙂 Thanks so much if ya do, and for the amazing recipe! Hi, I was wondering if I can possible make this recipe with normal tofu and substituting the pumpkim for something similar, I know these are drastic changes to the original recipe but: I live in a regional area in Poland and it’s difficult for me to find products such as “silken Tofu”and pumpkin at this time of the year. My husband has recently gone vegan and I’d like to cook something special for him. This was amazing. Simply brilliant. I made it for my omni (extended) family and no one knew, cared, or otherwise. It had just the right amount of tang. I left out the nana and just used more pumpkin. I REALLY want to make a chocolate one! I’m thinking about using sweet potato as the base, leaving out the pp spices (except the cinnamon), soakin the cashews in a strong coffee, and adding cocoa powder. What do you think? I’d love your opinion/tips……freakin’ vegan goddess, you are! I love this recipe. What could i use in place of pumpkin to adapt this as a blueberry cheesecake? I see that you used sunflower seeds for a mac and cheese recipe. Do you think sunflower seeds would work for this also? Have you tested it out yet? ….cashew, peanut allergy. But we’re good with other nuts. Thank you, and great site! can i use pumpkin pie mix (canned) instead of pumpkin puree?? Think of yourselpf as modeling personal development leadership. A Panama Corporation can invest anywhere in the world. most flexible terms, possibly a low minimum balance, and easy access to your account information. Has anyone tried making these as mini-cheescakes, in a muffin tin (with the little paper muffin cups)? I have a phobia of springform pans. Also I live at high altitude and little things are more forgiving. I have made the raw ones as minis many times and they are perfect. Pretty sure this will be dinner. And lunch tomorrow. Thank you Isa! I just made this for work and everyone loved it. One guy said it was in his top 5 cheesecakes ever. Then I told them it was vegan–they were stunned. It was awesome. I don’t own a springform pan, so I did this in a standard muffin tin with the gingersnap crust and it turned out great! I baked for 20 minutes, then added the topping, and then about 15 minutes more. I just kept an eye on it. The crust was a little oily, but it didn’t stick to the muffin tin at all (bonus). I sat the mini cheesecakes on some parchment paper and brought them in to work. I had some extra filling and topping, so put that in little glass dishes and baked those too (in a water bath). They worked great for my GF co-worker. Isa, you are truly a vegan Goddess extraordinaire! Thank you for posting a cheesecake recipe that doesn’t require expensive vegan cream cheese and hydrogenated oils. Love the pantry-friendly items used here. This cheesecake looks divine! How long would it keep in the fridge? As in, would I be able to make it 3 days in advance? So excited to try it! Someone brought this to a church lunch—oh myyyyy! My husband loved it so much, he went and got two more pieces! Wow!!!!! Soooo gooooooood!!!! This really works and everyone loves it. A warning to UK cooks – my tablespoon was a bit bigger than intended in the recipe (I think) so the cheesecake leaked coconut oil into my oven. I can avoid this mess next time! the tofu, does it matter if it is soft or firm? Made this for a crowd of omnivores who absolutely loved it. Thank-you, thank-you for this amazing recipe! I made mine with fresh pumpkin purée and fresh ginger. I soaked the cashews overnight. I put a pan of water underneath it in the oven and there were no cracks. All agree that I have to make it again. ooooooooo I just made one this afternoon, and it was more than I could have ever dreamed of, my first successful vegan cheesecake! Granted, I set the oven dial to a higher temperature (oven’s not been properly calibrated since I was in diapers), cooked longer than the recipe denotes, and let the cheesecake cool in the residual heat of the oven, and the center was still jiggly, and, as I unfortunately learned only after slicing, completely creamy and loose. But maybe an inch and a half from the edge was set VERY nicely. Another mind-blowing recipe. My cheesecake turned out extremely fragrant, and for a while I couldn’t place the familiar taste, but I just realized that with the aromatic orange zest and undercooked filling, it was like this orange creamsicle semifreddo I made in high school. Unexpected realization, but a very pleasant one. I just made this for Thanksgiving and it was incredible!! It set up perfectly after cooking for 50 minutes and was absolutely delicious. I used Mi-Del gluten free gingersnaps for the crust and they were great. Thank you for sharing this recipe with the world! I made this last year for Thanksgiving for my vegan cousin and I. Everyone loved it topped with a bit of whipped coconut cream (my cousin and I had to get a bit protective of the only vegan dessert). My family is already asking if I am making it again this year.